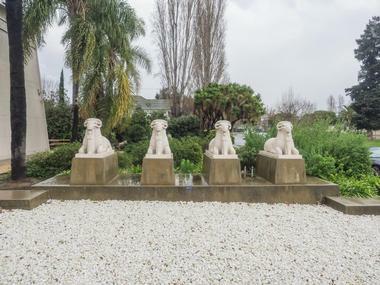 The Rosicrucian Egyptian Museum in San Jose, California was founded in 1915 and features the largest exhibition of ancient Egyptian antiquities on the West Coast of the United States. It is also renowned for the architecture of its building, which was constructed in 1966 in the ancient Egyptian architectural style. 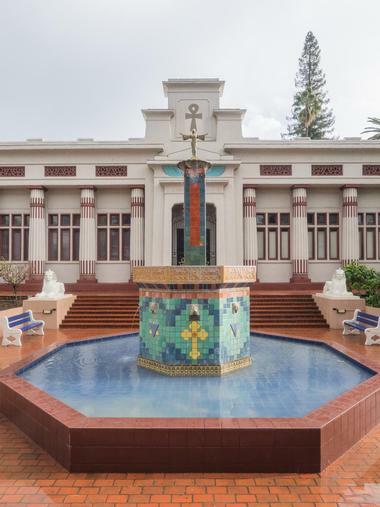 H. Spencer Lewis, founder of the Rosicrucian Order, Ancient and Mystical Order Rosae Crucis (AMORC), established the museum in 1928 in San Jose, California. According to the museum, he was inspired by an Egyptian Sekhmet (lion goddess) statue on his table, which later became the first artifact for the museum. Throughout the years, AMORC expanded its collection through private and public donations. 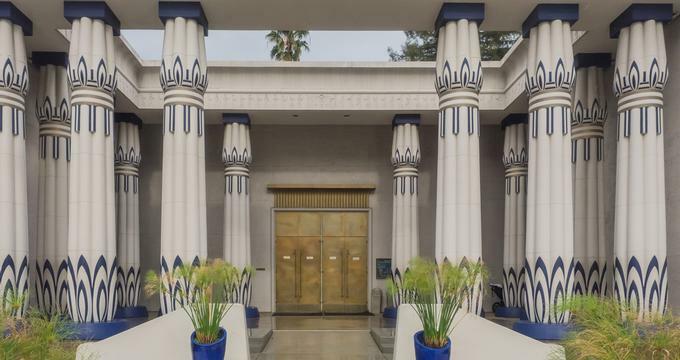 More importantly, a large part of its collection came from various excavation trips to Egypt that AMORC had sponsored, including a 1965 trip led by the son of H. Spencer Lewis. It was during a trip to the Temple of Amun in Karnak, located in the modern city of Luxor, that he drew inspiration for the museum’s current architectural design. Today, the museum houses more than 4,000 pieces, spanning from the pre-dynastic period to the early Islamic era. The organization views itself as ‘caretaker’ of the world cultural institution, to preserve and protect it for future generations to study and enjoy. 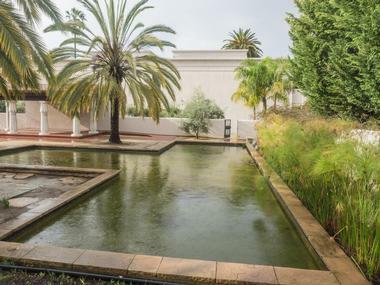 Apart from the artifacts per se, it has expanded beyond its four walls to include a park that is not only based on an 18th Dynasty Egyptian garden but also contains plants that were grown in ancient gardens. Adjacent to the museum, there is a planetarium offering complimentary daily shows as well as a library. The museum is also involved with ongoing research projects in collaboration with educational institutions and research agencies to improve understanding and interpretation of its collection. Some of the organizations they have previously worked with are Stanford University Hospital, UCLA and NASA Ames Biocomputation Center, among many others. The museum’s permanent exhibitions house antiquities from every major period in ancient Egypt, from pre-dynastic to Roman, which spans over 6,000 years. They have been organized into thematic galleries that start from burial practices and a tomb replica through to daily life, religion and kingship. The galleries are also peppered with direct quotes from ancient Egyptian literature and letters, a move that sought to give voice to individuals from the ancient civilization and represent them beyond their most well-known mummies. The Egyptians are known for their elaborate funerary practices due to the belief that the soul continues to live on even after death. For the living, providing the needs of their ancestors would also ensure the safety and prosperity of the living. The museum contains items from as early as around 3000 BC, a period that is widely recognized as the start of ancient Egyptian civilization. This includes an example of an early box coffin which is made out of wooden planks and minimally decorated. The coffin was intended to protect body from wild animals and was buried directly in the sand together with a few simple burial pots, bowls and other items. Due to the hot arid environmental conditions, the bodies were able to dry out naturally by the desert sand. In later periods, burial rituals became increasingly more elaborate together with the process of what is known as ‘mummification.’ This was a result of multiple factors including greater religious emphasis on the importance of the body in the afterlife as well as a better understanding of the preservation process. Mummification reached its peak during the New Kingdom between 11 BC and 16 BC. From canopic jars for storing organs to clay burial offerings, the museum offers an extensive collection about death in ancient Egypt, highlighting the importance of the afterlife to ancient Egyptians. On top of that, they also reveal details about their daily lives because the eternal life was conceived to be similar to the everyday but free of disease and unity with the gods. Two of the museum’s most well kept coffins are of Ta’awa and Usermontu, dating back to the 26th Dynasty, or around 625 BC. Although they arrived in the museum separately at different times from different countries, researchers discovered that both of them were likely to be close relatives, possibly cousins. Each of them are now displayed beside each other in the gallery and represent fine examples of funerary art in the museum. The museum also houses a full-sized replica of the interior of an ancient Egyptian offering chamber that was based on the rock-cut tombs discovered in Beni Hasan, an area near the modern day city of Minya. Its aim was to create an immersive experience for visitors to walk inside an ancient Egyptian pyramid. The walls are textured to make it resemble limestone and they are adorned with scenes from an important ancient Egyptian funerary text, the Book of the Dead. The rooms are intentionally kept dim to recreate how explorers would have discovered the room. The daily life exhibition stands in contrast to the earlier gallery where it celebrates the ancient Egyptians love of life, rather than death. A large part of these ancient lives was shaped by the natural environment, in particular the River Nile. The Nile proved to be vital for survival, providing water for farming, fish for food, mud for bricks and reed for papyrus. It was also a main mode of daily transport. This intimate relationship undermines the every day activities of ancient Egyptians. The collection displays items from people’s public and private life that reveals clearly ascribed gender roles. Men dominated work outside of home, a majority were farmers or fishermen, alongside other forms of professional work, such as scribes and potters. The exhibit showcases tools of the trade as well as the high quality craftsmanship produced by ancient Egyptian workers. They include pottery, metal chains and even surgical sets. Meanwhile, women ran the household and made sure that the ancestors were properly worshipped at home. Her primary responsibility was to bear as many children as possible, in part due to the high mortality rate. Furthermore, children were also responsible for ensuring that their parents received proper burial to guarantee their journeys into the afterlife. Fertility was therefore a main concern for Egyptian families, which is reflected in the amulets and fertility figures commonly found in many households. They could be seen in the museum’s collection, together with a spinning bowl and spindles that was widely regarded as a woman’s work. One of the museum’s oldest artifacts is also located in this gallery. The set of four bracelets made of shell and ivory dates back to at least 6,000 years ago. They were found near the body of a pre-dynastic woman. There are also items used for entertainment and relaxation, including wooden senet board. Senet was a widely popular board game played by people from all walks of life in ancient Egypt. Religion was an all-encompassing concept for ancient Egyptians, closely interwoven with every aspect of their lives from birth to death and affecting pharaohs and commoners alike. Understanding parts of it unlocks the rich breadth and depth the civilization has got to offer. Ancient Egyptians believed in a plethora of gods and goddesses who are in one way or another related to one another in complex webs of relationships. Some of the most prominent and important deities include Osiris, god of the underworld, his wife Isis, goddess of health, wisdom and marriage, and their son Horus, god of the sky, war and hunting. They are well-represented in the museum’s collection in numerous forms, such as statutes, drawings and on steles. The government of ancient Egypt was closely linked to the religious system. Pharaohs have derived their ruling mandate from their relationship with the gods, considering themselves the descendent of the gods or ‘Living Horus.’ Most of the exhibited artifacts came from the ancient city of Tell el-Amarna because AMORC had previously sponsored excavation activities there. One of the exhibits highlights is the statute of Cleopatra, who was the last and possibly most famous pharaoh of ancient Egypt. It is one of the few images of the female ruler that still remains today. Standing at 116cm (46 inches), the statue’s body had been modeled after classical forms as a means to allude to the queen’s lineage with generations of her family’s rule. The face and the triple cobra diadem suggest that the statue portrays Cleopatra. The significant portion of the museum’s collection are votives or offerings people present to god in order to establish a personal relationship with the higher being. A popular form of offering is a mummified animal that ranged widely from cats to snakes. Among the collection is a baboon that was used to honor Thoth, or god of the moon, who was sometimes depicted as a baboon. X-Ray results revealed that the votive contained no actual animal or its parts inside. Instead, it is formed around a ceramic jar that gives its shape and size. Back to: Best Things to Do in San Jose.